Visiting the Philippines is a great way to get off the tourist track, which is rather surprising, considering that the widespread proficiency in English makes traveling here pretty easy to figure out. Why more people don’t come here is a mystery to me. Maybe because there isn’t a well-defined backpacker circuit running through the country. There is a bit of a backpacker trail that runs through a portion of the north of Luzon, the huge main island that Manila is on. 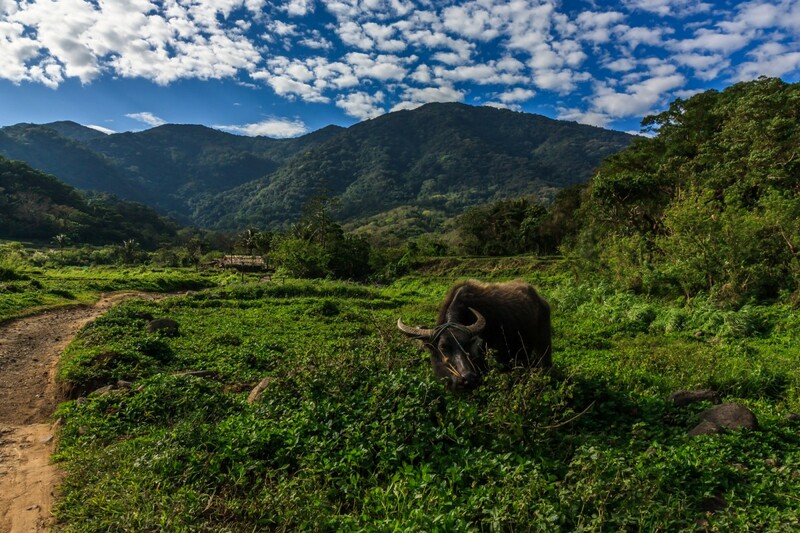 It goes up into the rugged, cool mountains, visiting ancient rice terraces, caves, and villages. But most people only visit a couple places. I added a few, and wish I could have added more. My first stop was the 2,000 year old rice terraces, a UNESCO World Heritage site. The small town of Banaue is the gateway, and there is an overnight bus from Manila that makes it easy to get to. 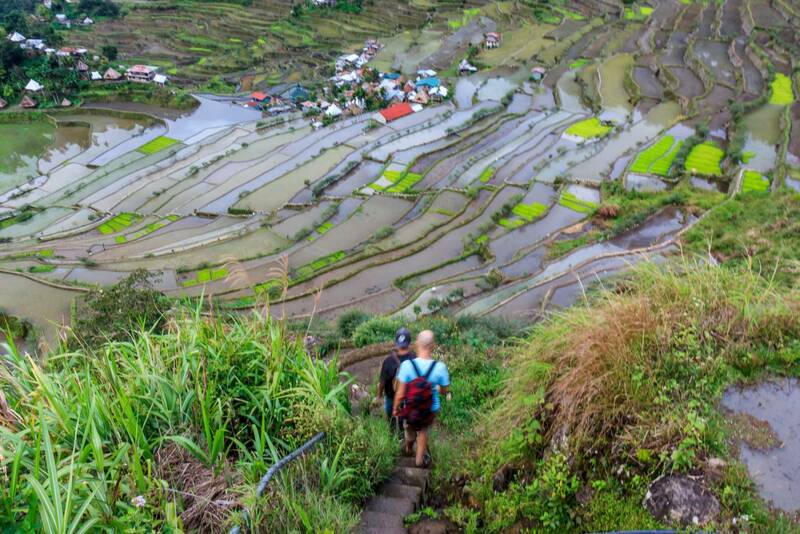 Upon arrival, the folks at the guesthouse make it easy to arrange guided hikes to Batad, the village among the terraces. When I was reading Lonely Planet and doing research on this before I left, I was confused by ambiguous instructions to catch jeepneys to and from “saddles” and “junctions.” Hiring a guide is inexpensive, supports the locals, and makes it so you don’t have to worry about those details. I only spent one night here. The food was good and the atmosphere was relaxing. 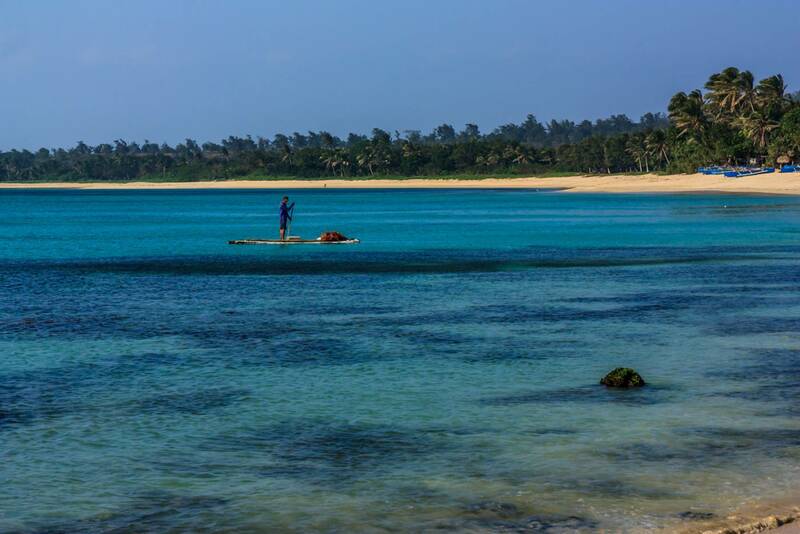 It’s possible to spend two, or even three nights, staying in different villages. More time is better, and I wish I would have stayed longer. Batad is a highlight of the Philippines. After spending the night, our guide got us back to Banaue by any means necessary, flagging down a passing truck, which we rode on top of. It’s worth spending the night in Banaue. I found the town interesting, and it’s possible to hire a tricycle to visit the rice terrace viewpoints. While not as spectacular as in Batad, they are still nice. 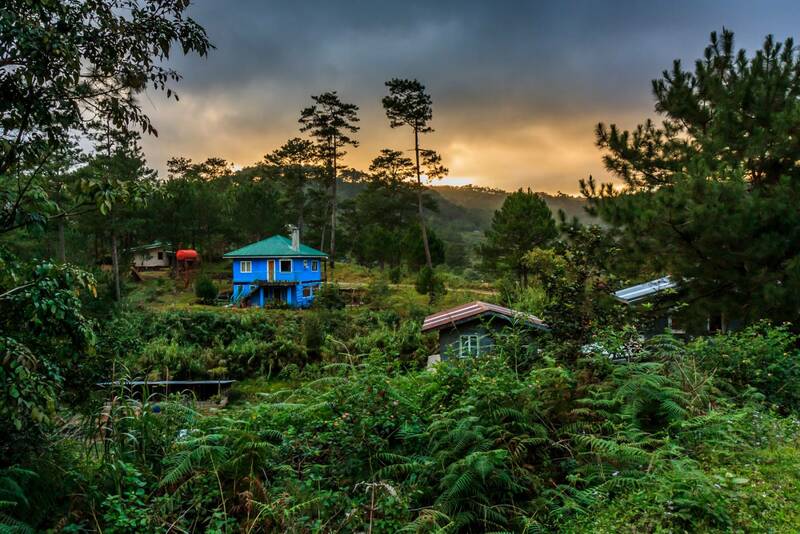 The next stop on the backpacker trail is the little mountain town Sagada, described as chill by Lonely Planet. It was anything but while I was there, mobbed by Filipinos on a public holiday due to the papal visit. It’s an easy jeepney ride from Banaue. Due to the crowds, it was hard to find a place to stay, but I did secure one after a bit of walking around. The crowds of Filipinos made it easy to forget that I was on the backpacker trail. It was a very local scene. There’s a bunch to see in Sagada: caving, hanging coffins, valleys, mountain and jungle trekking. I stayed four nights and wasn’t bored. They make it easy to hire guides to all of the attractions. Be sure to bring a flashlight. The power goes out at night, and it is dark walking back to the guesthouse. That’s about it for the well-trod backpacker trail. But there’s a lot more to North Luzon. From Sagada I headed to Baguio, the cool summer capital founded by the Americans. It’s a big, confusing, spread-out city. Once I found the main drag of Session Road, where many restaurants and bars are, I made that my base. The attractions, while perhaps not the most exciting, can easily fill a day. I found the former US Army base, Camp John Hay, to be interesting. It’s also always fun to be one of the only foreigners in town. I hate to slavishly follow Lonely Planet, but it was indispensable here for finding a cheap place to stay. I mainly used Baguio as a gateway for points further north. 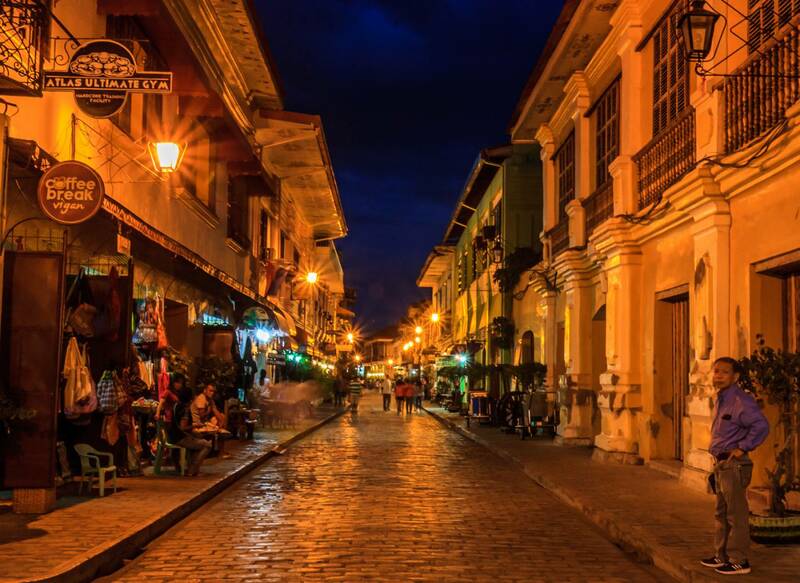 I wanted to visit Vigan, the best-preserved Spanish colonial town in Asia, and another UNESCO World Heritage site. There is a lot of Spanish colonial influence in the Philippines, but most of it was destroyed in World War II. Vigan survived, and its historic street is a nice stroll for a day. But that’s pretty much all there is to see. It’s probably not worth the long trip up here, unless you’re going further north. There are more attractions nearby, but they are difficult to get via public transportation. Having your own transport would be useful here. I was going further north, all the way to the beach-side town of Pagudpud. The beach there is really nice, and mostly undeveloped. Also, it’s completely deserted during the week. On the weekend there are a lot of Filipinos, but no foreigners. I was happy spending my first half day on the beach. On my second day I spent the morning on a trike tour, and the afternoon on the beach. Despite how nice the beach was, I was by myself, and got bored after that. So here’s my North Luzon itinerary. It leaves enough time for travel days. It’s about two weeks, which I think is a good amount of time to backpack before I need to stop somewhere to take a break. I didn’t book anything in advance for this trip, and arranged everything after arriving. It’s also not necessary to obsess over trying to figure out bus and jeepney routes. It’s always possible to just ask at the guesthouse how to get to the next destination.